White floral lace reflects a romantic wedding style, which is nicely balanced with the rustic flair of woodgrain. A matching lace design frames your names and wedding date on the backs of these vintage wedding invitations. Your wording is printed in your choice of colors and fonts. This invitation may also be used as a bilingual option. The front side allows up to 17 lines of copy and the back side allows up to 5 lines of copy. Invitation includes inner and outer envelopes. We ordered wedding invitations with response cards. I enjoyed that the site was pretty flexible in allowing me to customize it to my wedding/details. Same for the response cards.They were sent with two large envelopes. One called "Inner" & one called "Outer". I would have figured the inner envelope would have matched the size of the Response card, but is much larger. Otherwise, the card appears mostly in person as it did online. We are content with our purchase. Delivered quickly! My invitations came in the mail and they had the wrong font. Of course I started to have a bridal breakdown, but I called the costumer service line and was helped within minutes. They sent over a new proof and had the new invitations with the correct font in the mail the next day. No charge to me, and excellent customer service. I will return for all invitation needs in the future! 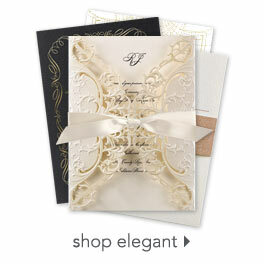 The invitations are beautiful, and I received numerous compliments on them.